A year ago Kenley Jansen was in the minor league catching. Seeing his arm was better throwing fastballs than catching them, he was converted to a pitcher. I actually went and pitcked him up in my MLB Fantasy team (Los Locos Azules) but ESPN still has him as a catcher. In the dugout with a big grin on his face, Clayton Kershaw was watching Kensley who had come in the 9th inning to save the game for Kershaw who had pitched 8 shutout innings. The kid Kensley looked calm on the mound. I on the other hand was nervous. 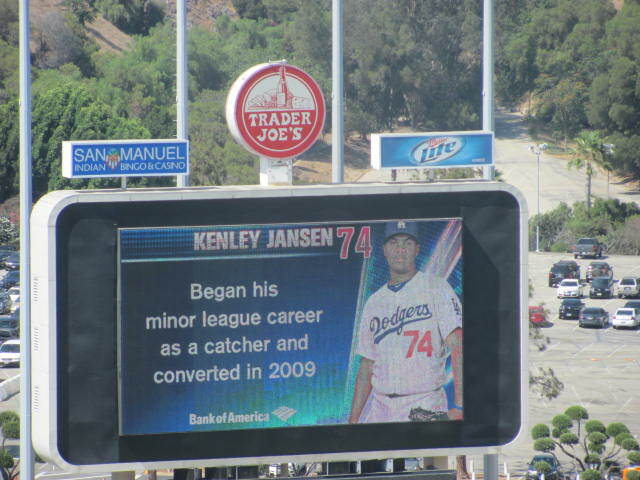 Kensley had made his major league debut the night before when the Dodgers used nine pitchers in the 13 inning game. Kershaw came out and gave him a big hug. See, when Kershaw was in the Gulf Coast league, Kensley Jansen was his catcher. “He had an incredible arm back then” kershaw said. Dodgers WIN! and take the series against the Mets 3 games to 1. Dodgers are off today and start a three game series with the first place Padres. Go Dodgers! Len who I baptised “crazy Mets fan” came from San Diego to watch the game. He sat in the right field pavilion for the AYCE (All you can eat). I caught with him before the game and after the game. This is after the game when the kids were allowed to run the bases. Afterwards the Media softball game started. Update: I uploaded the videos. 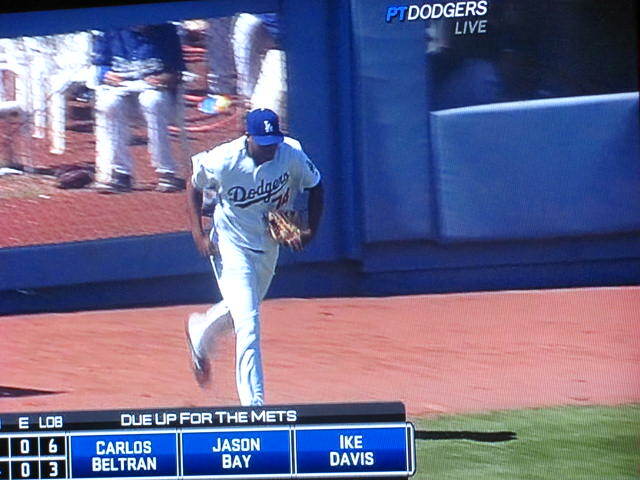 Also ESPN has updated Kenley from a catcher to a relief pitcher! You guys had a great series against the Mets. I had a friend who was at the Saturday game and said it was so exciting. Nice story about Kenley! It is just amazing to me some of these guys who have been converted as field players into pitchers the last few years. The Dodgers did it to Edwin Jackson when he was with your team before sending him to the Rays….And now he is the proud owner of a No-Hitter. Brandon Backe, the Astros pitcher who 1-hit the White Sox a few years back in the World Series was an infielder too. Amazing talent in the MLB, and it is very couragious of these guys to go back to the drawing board and re-invent themselves at this level. Hello Crazy Met Fan! A catcher converted to a pitcher…that’s a new one on me. It was a relief that we could take 3 out of 4. Padilla also played well but the bullpen let that one get away. It is amazing how some can covert but you know they already have the God giving talent. Some say that Furcal could have been a pitcher with the kind of arm he has but he is a great shortstop and enjoying a great year at the plate. I forgot to include a pic of Kershaw with the wide grin he had. It was so cute the way he hugged Kenley. That is a new one on me too to see a catcher converted to pitcher. Len is a nice Mets fan. I noticed he was sporting orange and blue shoes. Thanks for those video clips. It was great to see that interview with Kenley. I’m really excited about having him on the team. I think he can provide us with a well needed boost. Now we enter crunch time. Our whole season hinges on how we play in the next 10 games. Emma, the Dodgers need us to root very hard now. I’ll be sending my cheers through the computer directly to Petco. You are so welcome True! I created for fans that do not get to see the Dodgers or they might have missed the interview with Kenley. Agree that this is crunch time and we need to do well in SD to gain ground. 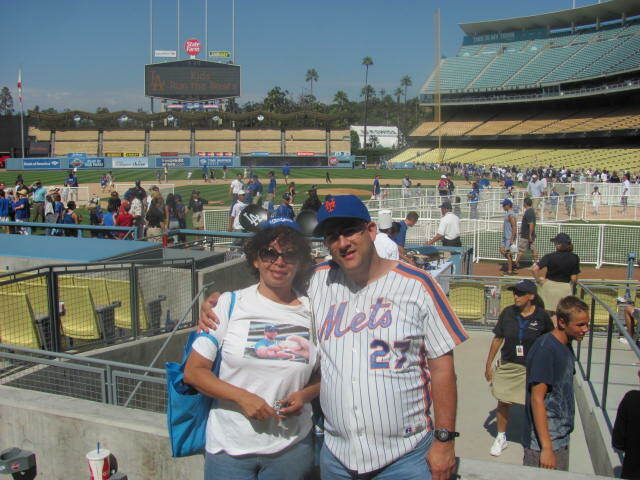 What a classic… that Mets jersey. And that a way to wear the number 74 proud! I can’t believe that the youtube video I recorded of Kenley Jansen already has over 5,000 views! wow! Just saw you on the MLBlogs page! Sweet! Congrats on the front page feature! I was in an antique store and saw two issues of Dodger magazine from ’81 & ’82 from Pennant victory time. Is something you might be interested in? I am guessing you already have them? Thanks for letting me know about being featured! WOW! ESPN also had him as a catcher and that is how I picked him up but they have corrected that. I would think Yahoo will do the same. Can you beleive that the video has over 5,000 views!? Thanks Mike! caught me by surprise! Thanks! 1981 and 1982 I have but if you find anything else, let me know! Thanks! BTW, how much are they and who is on the cover? I’ll check what I have. One cover was a collage, which included images of Lasorda and Rick Monday, I think. They weren’t much, like 10 or 12 bucks. I can’t remember the images on the 81 cover. Both were pennant features. In the meantime I will dig up some Lasorda photos I know you don’t have, because I took them! when I get home, I’ll check what I have. I bought the 1988 W.S. program at the FanFest in Frisco a couple of years back. 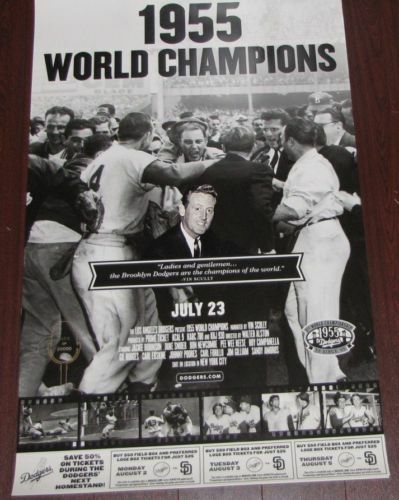 55 since ’55 Poster Night Featuring Vin Scully!